Black Friday is but a distant memory, the unwrapping ceremonies are complete, and Santa is back at the North Pole sipping hot chocolate, if not something stronger. The attention this week turns to a new year. Though it's too late to plead your case to Santa, this may be a good time to take stock of your basic forage tool inventory; items that cost relatively little but can return many times their weight in worth when used routinely and correctly. We're not talking about a new baler or chopper, but rather those items that help make on-the-fly decisions of when to start harvest, when to stop harvest, and when to make adjustments during the harvest process. Regardless of farm size or machinery lineup, these are items every forage farmer needs in their tool belt, though not every item applies to all operation types. Many of these tools may not be at the same analytic level of a research program or testing laboratory, but they will help prevent major forage decision train wrecks. If you grow forage that is mechanically harvested, having a means to measure moisture both before and during harvest is a must. Moisture content is at the root of so many forage decisions that it doesn't make sense not to be able to measure it. Pick your weapon of choice: microwave, Koster (or similar forced-air) tester, or food dehydrator. Even if you use a direct-read capacitance probe for baled hay, you still need one of these other items to check and calibrate. Used correctly, they can all be reasonably accurate; used incorrectly, they will all lead to erroneous decisions. This item could have been included in the previous section, but the importance of a good-quality gram scale can't be underestimated and requires special emphasis. Moisture results hinge on an accurate wet weight and dry weight. A cheap, only sometimes accurate scale can easily be the weak chain link in the quest for reliable results. Keep the scale clean and store it in a dry area at room temperature. The Penn State Particle Separator (PSPS) is a tool that measures the particle size of forages and total mixed rations. The latest version enables the ability to estimate physically effective fiber (peNDF). The PSPS has become a standard tool for most nutritionists and many farm managers. It offers a first line of defense to evaluate forage harvester and TMR mixer operation. It can also be used to check kernel processor effectiveness in corn silage. There is good science behind the PSPS, but some practice is needed to shake samples properly. Learn more at the Penn State Particle Separator website. When equations were developed by University of Wisconsin researchers to estimate the quality of standing alfalfa, this opened the door for a quick evaluation that didn't require the time and expense of sending in a fresh sample to a forage lab. Many forage organizations and companies now provide PEAQ (predictive equations for alfalfa quality) sticks at little or no cost. A method to estimate standing forage quality based on alfalfa height for alfalfa-grass mixtures was developed at Cornell University. Though the PEAQ stick concept has been tested in several U.S. regions and is relatively simple to use, there is a defined procedure for using the stick that must be followed. This is an item that should be under the seat of every alfalfa grower's truck. Estimating pasture forage yield is not particularly easy without a lot of practice, but either of these tools will help to develop a strategy for moving livestock from paddock to paddock. Pasture (or grazing) sticks are available in different states but may not be exactly the same because of predominant pasture species variation. One example can be found here. A rising plate meter offers the added benefit of a more direct density measurement. These can be homemade or more extravagant manufactured models. Properly processed corn silage is critical to maximize milk production. Several on-farm quick tests that allow for immediate harvester adjustments have been developed that entail very little cost. For the frugal at heart, one is simply the use of a 32-ounce cup. Several methods were discussed in a previous eHay Weekly article. Anyone in the business of buying, selling and/or feeding hay needs a good hay probe. Probes come in a variety of shapes and sizes and are powered by hand cranking, cordless drills and gas motors. How much you want to invest will depend on how often samples need to be taken (hand cranking can get old pretty fast). 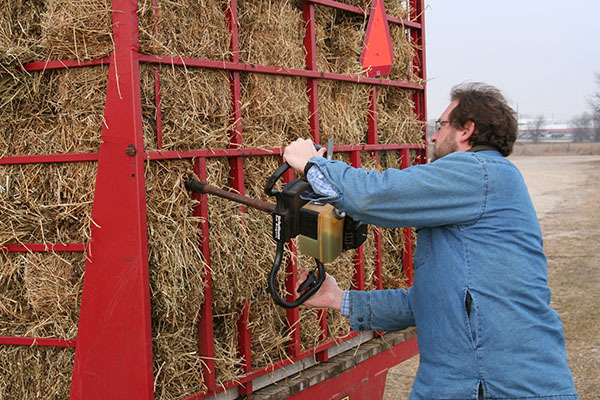 The National Forage Testing Association offers this list of hay probe vendors as a starting point to compare various options. From sticks to shaker boxes to a good gram scale, a well-equipped forage tool belt can make you money or at least help keep you from losing money. The effectiveness and accuracy of results derived from the use of these items is contingent on recommended use procedures coupled with practice and experimentation.